“The Note has always been our showcase for premium technology and industry-defining innovation, and Galaxy Note 9 is no exception. It’s designed for a level of performance, power and intelligence that today’s power users want and need,” said DJ Koh, President and CEO of IT & Mobile Communications Division, Samsung Electronics. As with the Galaxy Note 8, the Australian version of the Note 9 will run on Samsung’s own Exynos 9810 processor. The device will also tout the usual 6.4-inch Infinity display (the largest in a Note device ever), 6GB of RAM and 128GB of internal storage (in addition to a MicroSD slot) plus a sizable 4000mAh battery (also the largest in a Note device ever). There’s also a larger variant of the Note 9 with 512GB of storage and 8GB of RAM. As previously rumored, the Samsung Galaxy Note 9 will launch alongside the Android version of popular battle royale game Fortnite. The new mobile version of the game will be launching today, with the beta exclusive to Samsung handsets for the first "couple of days". Other Android devices able to download and play the game later this week. Galaxy Note 9 pre-purchasers will also the option of a special in-game ‘Galaxy’ skin and 15,000 V-Bucks instead of the usual noise-canceling AKG headphones. This time around, the rear-mounted fingerprint sensor found in the Note 8 has also been slightly relocated to sit below the device’s camera array - a revision that’s sure to delight Note 8 owners. The Note 9 also promises to bring Samsung’s DeX accessory is also being brought back into the fold in an excitingly different way. Note 9 owners will be able to connect their smartphone directly via a USB-C-to-HDMI dongle into a compatible monitors to allow for a portable desktop experience. Samsung are also putting a special emphasis on the S-Pen in the Note 9. The company’s Note series is pretty much the only smartphone rocking a stylus these days. However, they’re looking to add further value to the hardware inclusion through support for new S-Pen features like the ability to use it as a remote control for power-point presentations and taking photos. You can even use it to play and pause Youtube videos. Of course, all these new features do come with a caveat: they rely on the forty minutes-worth of usage stored by the new S-Pen’s battery. Thankfully, fully recharging the S-Pen only takes about a minute. Speaking of the camera, the Note 9 uses more-or-less the same photographic configuration found in the Galaxy S9+. It’s got a dual 12-MP rear camera with one variable aperture lens that switches between f/1.5 and f/2.4 and a second wide-angle sensor that allows for 2x lossless zoom. In addition, it’s equipped with new ‘Intelligent Camera’ features that cover everything from scene recognition to letting you know when someone blinks at the moment the image is captured. As usual, the Note 9 will feature support for wireless charging. However, to sweeten the deal this time around, it’ll also support fast charging via both wireless and wired charging. The only thing that’s not cutting edge here is the operating system. At launch, the Samsung Galaxy Note 9 will run on Android 8.1 Oreo. The latest version of Android, Pie, launched earlier this week. 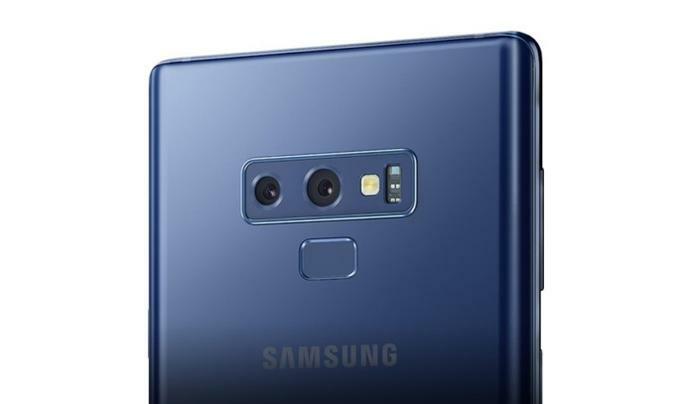 Coinciding with the global announcement for the Galaxy Note 9, Samsung Electronics Australia has announced the new smartphone is available to pre-order from today for RRP $1,499 (128GB) and RRP $1,799 (512GB). The Galaxy Note9 will be available in three colours including Midnight Black, Ocean Blue and from select retailers, Metallic Copper. Customers who pre-order the Galaxy Note 9 from a participating retailer before 24 August 2018, when the device officially launch, will receive the Galaxy Note9 512GB for the advertised price of the 128GB model.